Forty-two days have passed since the last laboratory-confirmed case was buried on 28 March 2015. 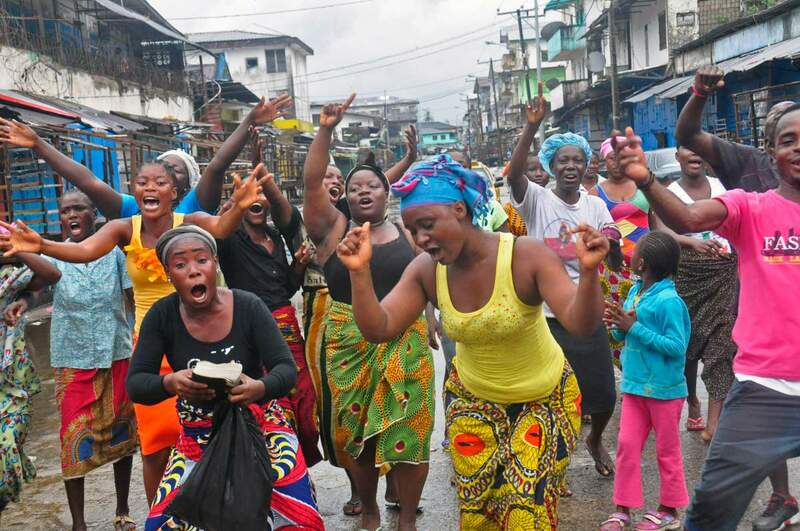 The outbreak of Ebola virus disease in Liberia is over. So it’s high time I redeemed my promise to return to the ‘war on Ebola‘. In previous commentaries I discussed the militarisation of the epidemic and, in particular, the mission of the US military under the direction of US Africa Command. 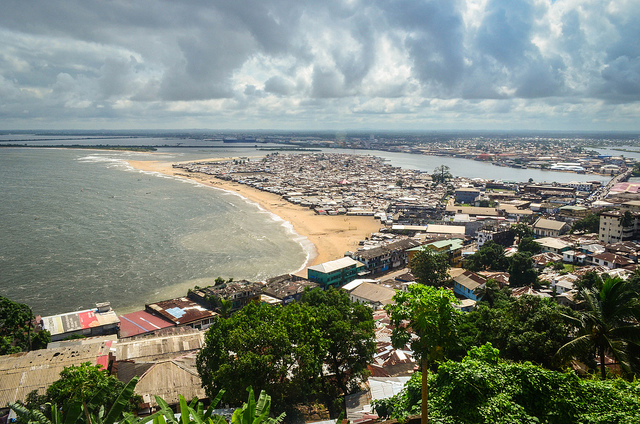 But the ‘West Point’ in my title is thousands of miles from the US Military Academy in upstate New York… It’s a sprawling informal settlement in Monrovia, the capital of Liberia (below). In an extended essay in the New Yorker earlier this year, ‘When the fever breaks‘, Luke Mogelson told the story of Omu Fahnbulleh and her husband Abraham. They lived with their three children in Robertsport in northern Liberia. Last summer Fahnbulleh tested positive for Ebola; by the time an ambulance arrived Abraham was sick too, and they were both loaded into the back and driven off. Fahnbulleh and her husband believed that they were going to a hospital. 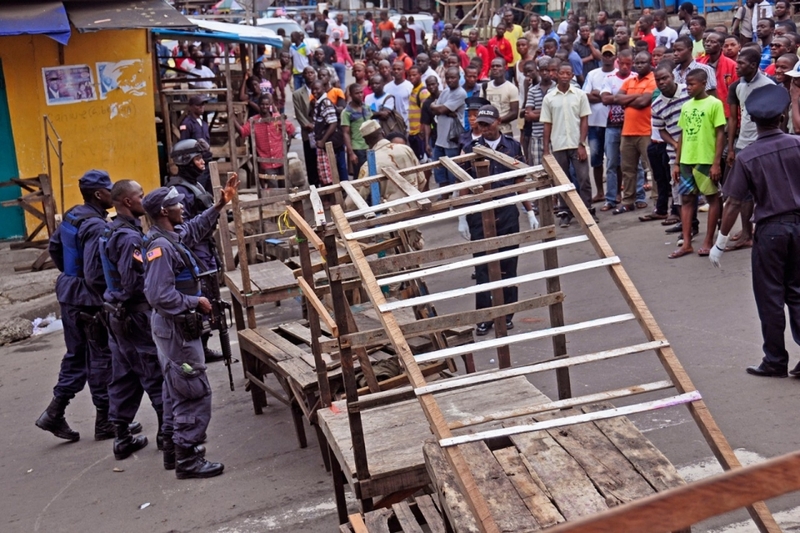 Instead, several hours later, the ambulance turned onto a narrow lane that ran past low-slung shops and shanties. 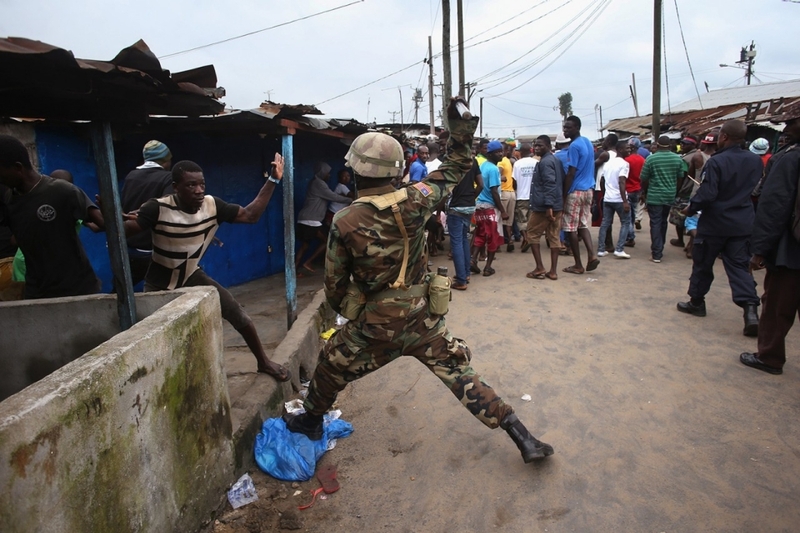 Fahnbulleh realized that they were in West Point, Monrovia’s largest slum. A police officer opened a metal gate, and the ambulance stopped inside a compound enclosed by tall walls. In the middle of the compound stood a schoolhouse. The driver helped Fahnbulleh and Abraham through a door, down a hall, and into a classroom. A smeared chalkboard hung on one of the walls, which were painted dark blue. Dim light filtered through a latticed window. On the concrete floor, ailing people were lying on soiled mattresses. When Fahnbulleh lay down, she saw that the two men beside her were dead. This was the only school in West Point, originally built by USAID, and it had been converted into a ‘holding centre’ for Ebola patients; the only ‘treatment’ on offer was provided by a man in a biohazard suit spraying the floor, the walls and the patients with chlorine. Two nights later Abraham died, and as soon as it was light Fahnbulleh – convinced she would die too if she stayed – determined to escape. At daybreak, after spending the night in the other classroom, she walked out of the school. Policemen loitered in the yard. When Fahnbulleh reached the gate, they let her pass, afraid to touch her. After several nights of sleeping rough she was taken to an Ebola Treatment Unit at a government hospital, from where she was eventually discharged. John Moore’s photographs of this crisis show in full the brutality of people’s daily lives torn apart by this invisible enemy. However, it is his spirit in the face of such horror that garners praise. His images are intimate and respectful, moving us with their bravery and journalistic integrity. 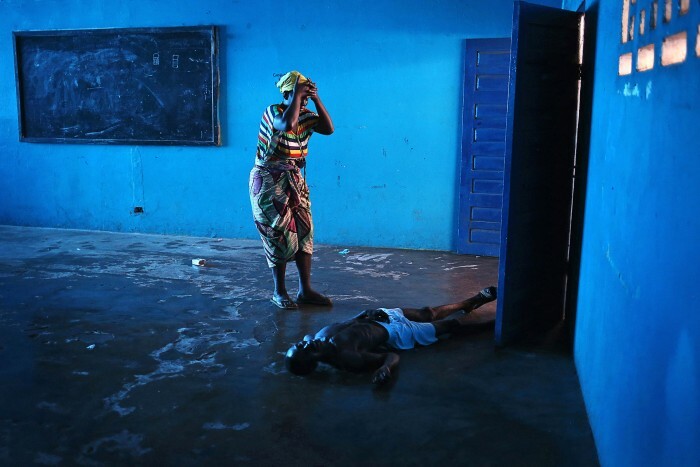 It is a fine and difficult line between images that exploit such a situation, and those that convey the same with heart, compassion and understanding, which this photographer has achieved with unerring skill. Combine this with an eye for powerful composition and cogent visual narrative, and good documentary photography becomes great. I’m not sure that Omu Fereneh is Omu Fahnbulleh, or Ibrahim Abraham, but it would be a remarkable coincidence if they were not the same people. In any event, soon after the photograph was taken and soon after Fahnbulleh escaped, the situation in West Point changed dramatically. Realising that their community had become a dumping ground for Ebola victims from all over Liberia, local residents stormed the schoolhouse and demanded it be closed. They ransacked the building, making off with mattresses and sheets, and evicted over 20 patients who they claimed had been brought in from outside West Point. On August 20, President Ellen Johnson Sirlief ordered the only road leading in to the slum be sealed off, and the entire community placed under quarantine. As the army moved in, many of the city’s vagrants who slept in the slum at night were trapped inside. The imposition of a militarised quarantine was a double mis-step. First, it exacerbated the already precarious position of West Point residents. Many of them were refugees and child soldiers from Liberia’s civil wars; they were crowded together in makeshift corrugated-iron shacks, almost all of them without plumbing or running water. The district is threaded by narrow sand alleys – there is only one paved road – and by open sewers. 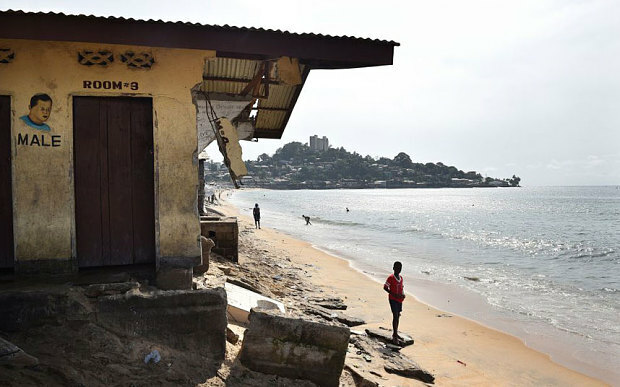 In 2009 the UN Office for the Coordination of Humanitarian Affairs reported there were only four public toilets in West Point; to use them cost 2-3 cents, and many chose to use the beach instead. Poor peri-urban residents, with no money to purchase and store in bulk, buy essentials daily. When lock-down, intended to halt disease spread, occurs, shops, markets and transport facilities are closed, reducing opportunities for peri-urban residents to work and earn cash for food. Many of their activities continue clandestinely, undermining the health intervention. During attempts in West Point to contain the spread of Ebola, people found new ways of moving through the area quarantined in August 2014. 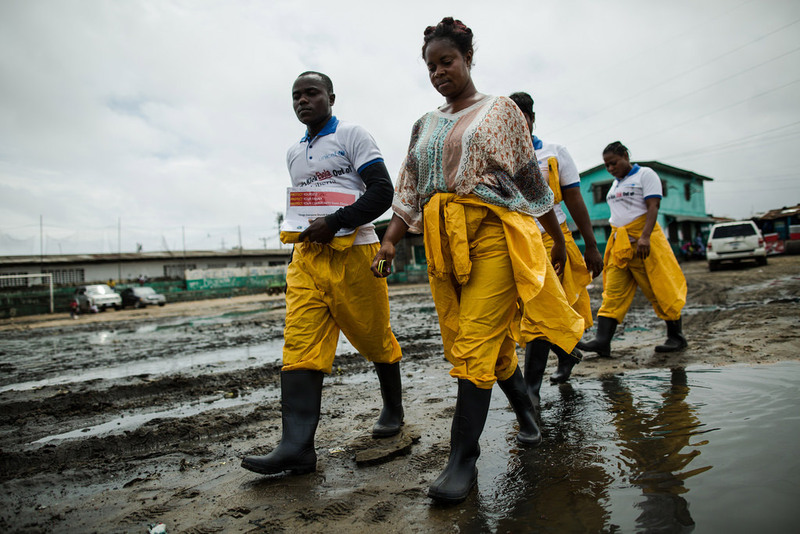 Their concern was not exposure to Ebola, but their inability to access food and water. “We suffering! No food, Ma, no eat. We beg you, Ma!” one man yelled at Ms. Johnson Sirleaf as she visited West Point … surrounded by concentric circles of heavily armed guards, some linking arms and wearing surgical gloves. 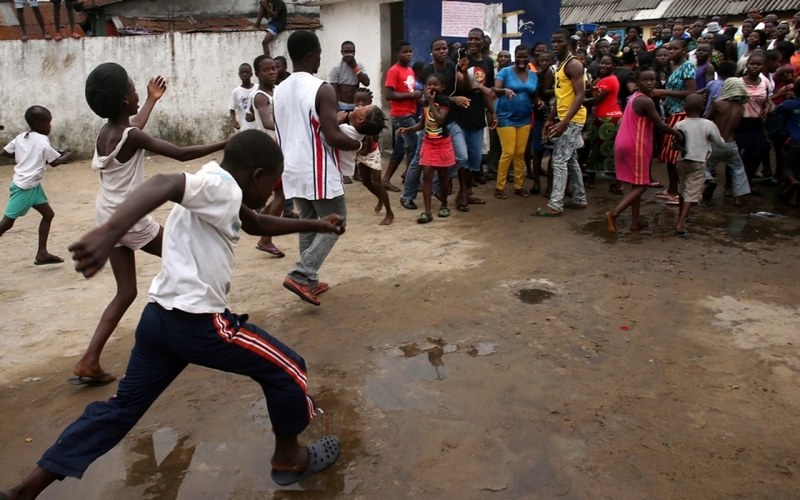 In the face of Ebola, and with the pressure on governments to act, the peri-urban area becomes an attractive place to intervene. 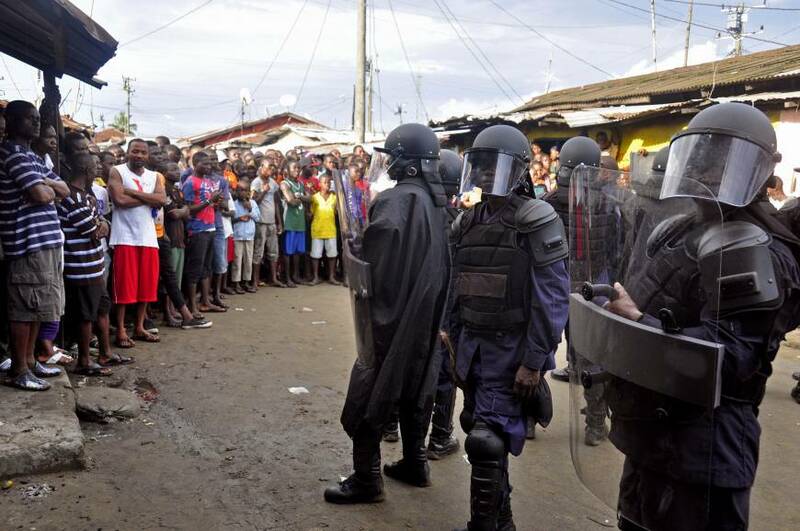 The deployment of the military and the police to quarantine the peri-urban is a tangible manifestation of state power that is oppressive for residents. Thus quarantine-related activities fulfil the political role of assuaging the urban elite’s fears of contagion – ‘cleaning up’ the peri-urban by excluding the poor, rather than helping them or addressing the key challenges of the disease. Not surprisingly, the imposition of quarantine provoked concerted collective protest. Hundreds of young men tried to storm the barricades and force their way through the makeshift checkpoint. Soldiers and police opened fire, killing a fifteen-year-old boy. Second, as this implies, quarantine is not an effective counter-measure and may well be counter-productive. Sealing off ‘plague towns’ was a medieval and early modern response to infectious disease – remember your Foucault! 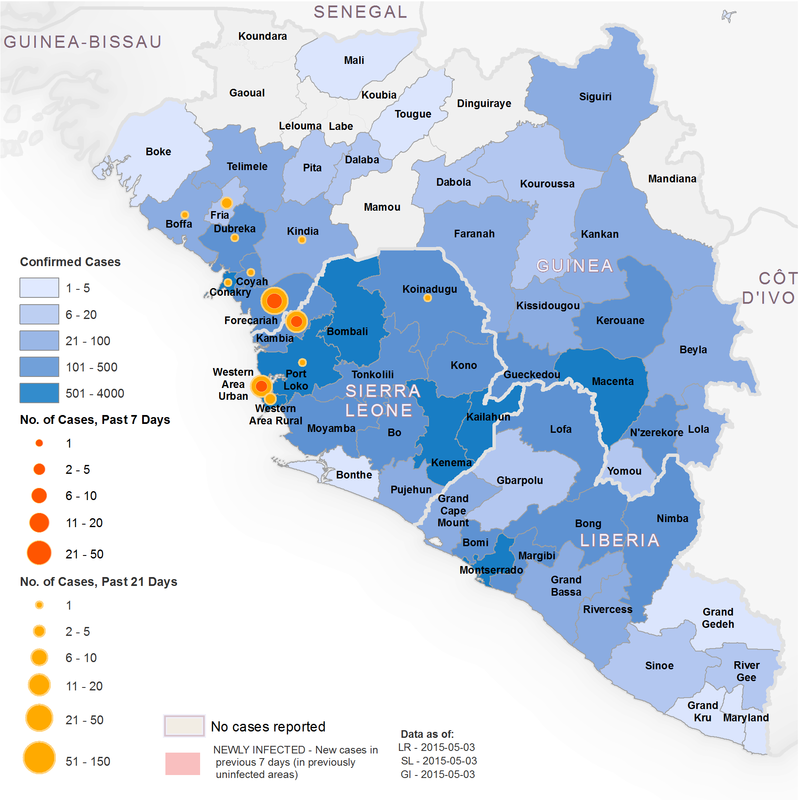 – but as one commentator noted, ‘isolating a small group of unhealthy people with a large group of healthy residents can cause more harm than good if they don’t get access to food, water and medical care — all of which are in increasingly short supply.’ In fact, transmission of Ebola occurs through bodily fluids once a patient shows symptoms of the disease, which means that the most effective response is not mass quarantine but the isolation of individual cases. This places a premium on contact tracing (you can find another image gallery from John Moore here, tracking a tracing coordinator in West Point; see also my previous post for more details and links on contact tracing). Following negotiations with community leaders, the government eventually agreed to lift the quarantine. ‘We are out of jail!” declared one triumphant resident. In West Point, the job fell to the neighborhood. “We had to guarantee that the things that needed to be done would be done by ourselves,” Archie Gbessay, another local leader, who worked with Martu to carry out the interventions, told me one afternoon in November. We were walking down the main road that snakes through West Point. Gbessay wore a knapsack filled with case-investigation forms and kept his thumbs hooked on the chest-strap clipped across his sternum. He is twenty-eight years old but exudes a quiet force that seems to have accrued over a much longer life; his face quivers with intensity when he talks about Ebola. “If we didn’t do this, nobody was going to do it for us,” he said. At first, family members hid bodies and buried them under the cover of darkness. This is one of the reasons that the disease became an epidemic. Attitudes changed only when people noticed that in almost all of the houses where someone died, another person later got sick. In one household, more than seven people died after they vehemently prevented contact tracers from entering. Now, when residents of the slum felt unwell, they came here to be diagnosed and, if necessary, wait for an ambulance that was staffed by West Pointers and managed by Martu. The average wait time had become a matter of minutes, rather than days. This entry was posted in Africa, biopolitics, medical geography, photography and tagged contact tracing, Ebola, isolation, Liberia, Monrovia, quarantine, West Point by Derek Gregory. Bookmark the permalink. Derek Gregory with another thoughtful and strikingly illustrated post on Ebola in Liberia.